But, I don’t really chat much with those folks. And I’ve been missing having a sewing buddy. To that end, I’ve opted to join some swaps! Years ago I used to participate in swaps through several lists on yahoogroups. I’m still on those lists but over the years they have become less and less and less active. I’ve done a few other swaps, in the mean and in between time, via the Quilt Art mailing list and some ladies on there. But I think I was missing the connection part, where you get to talk about what you are working on and show them pictures and, well, make friends. 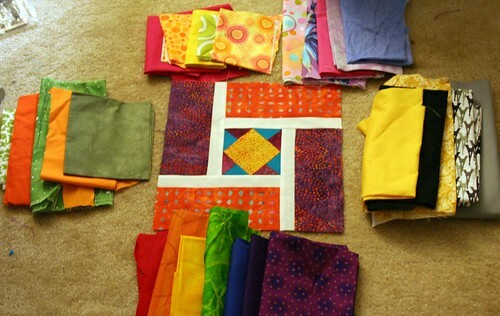 The block in the center is using my colors (purple, orange, teal & yellow) and the fabrics around the edges are the fabrics I’ve chosen for my partners in their selected color pallets. The block is “Envy” from Modern Blocks, which I received as a Christmas gift this year. Next up, I’ll be participating in the Doll Quilt Swap cycle 12!. It’s a blind swap – you make and send a small “doll” quilt to someone who doesn’t know who you are and you receive the same in return. I received my name this morning, so now I have to start stalking my partner and find out what they like! I’m very excited about this one. My quilt wall could use some serious refreshing. That one is due to be sent on April 2ndish. Expect to see some blog posts about it. I have nothing to show for that one yet, but I’ll get there soon! Tagged block, blocks, doll quilt swap, envy, exchange, friends, modern blocks, nubees, Quilt, quilters, Quilting, swap. Well, I’m glad to have met you, through flickr, Karen!